A Syrian director dusts off memories of the past, when people were persecuted for their political beliefs. A poetic portrait of people whose homes have been turned to rubble, and a story that tells us that a free life can never be monochromatic, let alone khaki. 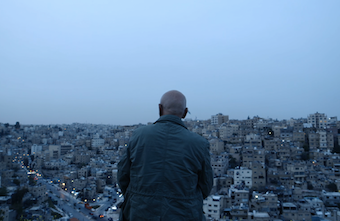 “I can’t be myself anywhere else,” Alfoz Tanjour says at the beginning of his heavy narrative on Damascus, the hometown he had to leave years earlier. He and other Syrians speak about the era before they were forced to flee the reach of the merciless regime; they dust off memories of the past when people were persecuted for their political beliefs. “We were demonstrating to bring down the khaki color.… We were against the color, in its symbolism,” says one of the protagonists, Ibrahim, about his 1970s childhood, and about the militaristic state apparatus that tried to extinguish the least indication of resistance. The ever-present fear, unexpected outbreaks of terror, dark prisons – these are the common denominators of the majority of stories, and they led to revolutionary outbreaks in Syrian society. A poetic portrait of people whose homes have been turned to rubble, collected fragments of memory in a film that tells us that free life can never be monochromatic, let alone khaki.